what should i cast it with? what to color it with? I would try something like Smooth-On's "Crystal Clear" resin (or any translucent/clear resin you can find) and their "SO-Strong" pigments. By using a clear resin you can pigment it to get a good balance of translucency, which will give you that same life-like effect as silicone. The challenge will be formulating a pigment ratio that gives you the right balance of translucency without being too clear. Then you can paint the casting with light washes, airbrush, translucent paints, etc. to add details without knocking down the translucency too much. 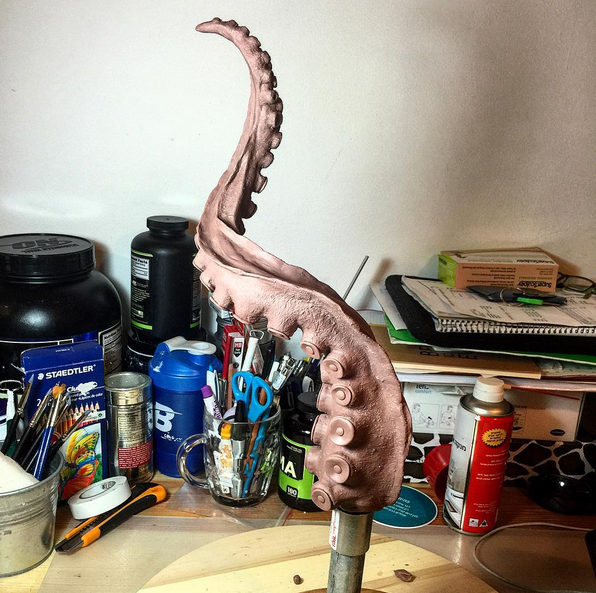 I suggest doing a few test castings of just the tip of the tentacle to see how your pigment formula is working. Testing on a thinner section is key because that is where your piece will allow the most light through. You could try using a harder silicone like Ecoflex 40 or dragon skin and put a rod inside when casting the silicone so the weight doesn't make it bend. You could have a threaded rod so you could screw it a heavy base so it can stand stationary on its own but taken off to lay down. Might be cool to put some kind of flexible rod inside and use a soft silicone so you can bend it into different shapes.